With interest rates at record lows, investors have been searching high and low for a decent yield. And they’ve been finding them, but not where you might expect. Conventional wisdom says to buy bonds and term deposits for income and shares for growth, but low interest rates have turned that advice on its head. Instead, investors seeking income have been flocking to local shares for their relatively high dividend yields, but are they safe? 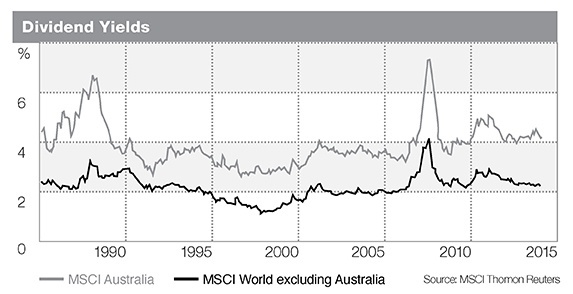 The average dividend yield on Australian shares was around 4 per cent in the second quarter and more than 8 per cent for some high-yielding stocks. While yields have fallen in recent years, they are still streets ahead of traditional income-producing investments. While equities can and do provide a valuable source of income, investors who have ventured out of term deposits into shares in pursuit of higher yields need to understand the difference between a sustainable dividend income and a high yield. One will boost wealth while the other may potentially cost you money. Australia’s major banks have a history of strong profit growth and reliable dividend income, making them extremely popular with income investors. But the highest yields in the current market belong to some out-of-favour resource stocks. Fortescue Metals has a dividend yield of more than 7 per cent before franking creditsiii, thanks to a 65 per cent fall in its share price in the year to April. As the share price falls and dividends remain unchanged, the yield rises. Fortescue’s share price, and its business, have been hit hard by the fall in iron ore prices. If commodity prices recover, the shares may rebound and the dividends may keep flowing. But in the meantime, investors who are tempted to buy Fortescue for its yield alone need to weigh up whether its current dividend policy is sustainable. This is not a recommendation or otherwise for Fortescue or National Australia Bank, they simply illustrate the importance of understanding how a dividend yield is derived and what it may signify. When companies earn a profit, directors decide how much of their earnings to pay shareholders in the form of dividends and how much to reinvest in the company to fund growth. So a high yield might signal that the company has poor future growth prospects. Or a falling share price, or both. But if a company’s growth outlook is sound, a high yield may indicate a buying opportunity. That’s what happened following the financial crisis when yields on many quality stocks soared as dividends were maintained in the face of falling share prices. Investors who banked on fundamentally sound companies bouncing back were rewarded with strong capital gains as well as a steady income stream. Unlike term deposits, the total return from shares comes from a combination of income and growth. While dividends provide a buffer against short term capital losses, both elements need to be taken into account over the long run. The bottom line is that you won’t make money out of bad stocks no matter what the dividend yield. But sustainable dividends that grow over time are a gift that keeps on giving. If you would like to discuss your income needs, give us a call.